I’m not sure what was more of a tragedy to Twitter users yesterday – Hurricane Sandy or Disney’s acquisition of Lucasfilm. More specifically Disney’s purchase of the entire Star Wars Universe (Now, before people get all up on me, Hurricane Sandy is the most important event happening this week and in the weeks to come). Seriously, at the time I began to write this piece, four of the top ten trends on Twitter was about Lucasfilm. Now, before you set your blasters to ‘kill’ and head to the Lucas Ranch, hear me out. I promise you, this isn’t the end of our beloved films. They have survived revisions, remasters, renamings and repackagings before, so why wouldn’t they now? Greedo shot first tore at our hearts, and we survived. And Jar Jar Binks. We forgave Lucas for that one, didn’t we? But, I must admit, all this outrage has me a little bothered. For years, Star Wars fans wanted more. We were promised more. So, George Lucas gave us Star Wars Episode I in 1999, and we spit it back in his face. For some reason, it wasn’t good enough for us. We held the original trilogy to such a high standard that we forgot that they too came for the mind of George Lucas. He lost our trust and drew our criticism. He shelved his plans for sequels because of us and now we wonder why he decided to hang up his hat once and for all? George Lucas had said that he planned to pass Lucasfilm on to someone else one day. It is no surprise that he decided to sell it to Disney. For whatever reason, Disney has taken it upon itself to become the curators of great creative companies. If it weren’t for Disney, we wouldn’t have The Avengers today. Hell, we may not even have Marvel if not for Disney’s Scrooge McDuck vault full of gold bars and coins. In our rush to make new internet memes aimed at poking fun or posting outrage over Lucas’s decision, we failed to remember the greatest thing Disney had done for all the companies it had acquired in the past – it left them to their own devices. After acquiring Marvel, Disney allowed it to remain it’s own separate organization. Other than being able to put Mickey Mouse in it’s comic strips legally, Marvel kept doing what it wanted to do. There is still gore and violence in it’s comics, all the staples of a well-rounded nerd diet. Princess Leia, if you want to consider her a ‘Disney Princess’, is worth more as a role model than 10 Bella Swans taped together. And, she hot. That’s always a plus. So, why are we in a rush to think that Disney will do anything different with the Lucasfilm acquisition? Disney has already said that no one will lose their jobs at Lucasfilm and that Kathleen Kennedy, a longtime producer of Spielberg films, will be the new president of the company. Although it is unclear what may happen to Dark Horse’s Star Wars comic book (I suspect it will be allowed to run out whatever remaining agreement it has and then be sent to Marvel, unless another deal is struck), everything else at Lucasfilm, ILM and LucasArt will be remain in good, caring hands. Exactly! 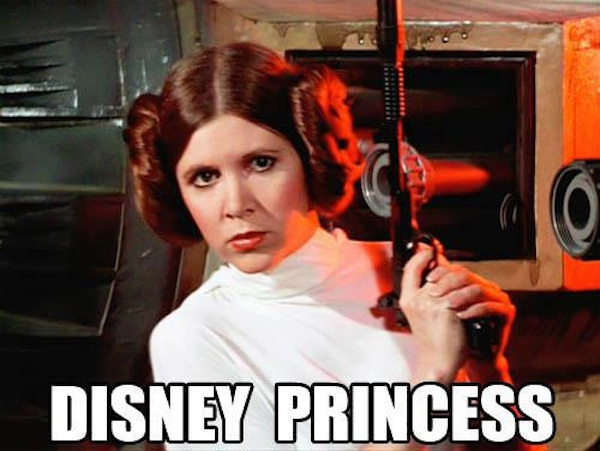 Disney wants to make money off of Star Wars. That’s no secret. But, they also know how picky Star Wars fans are about their content. Under the stewardship of their new president, I feel that Lucasfilm will attempt to do great work with the upcoming Star Wars films and with any other media they choose to take the franchise to in the coming years. And maybe with fresh eyes looking at Star Wars, we will get a new trilogy that will bring our kids into the fold and spark a new love of Star Wars in an entirely new generation, much like The Clone Wars is trying to do. To me, I only see good things coming from Lucasfilm in the coming years. We Star Wars fans are like battered puppies. We want so badly to trust what we love but are afraid of being kicked across the room. Given the wealth of very talented people turning out quality expanded universe novels and comics and games, I refuse to believe there isn’t someone, or a whole team of someones, who won’t be able to do the series justice. I wouldn’t know about all the new clone wars stuff. The past year or so I have been ignoring anything that isn’t the original unaltered trilogy or part of the expanded universe (anything taking place AFTER Jedi). It has been a happy life, and I hope this news will mean I will finally get a treat from my master, instead of a boot to the head.